Thoughts of New Orleans often arouse the imagination. For outsiders there is a mysterious, romantic quality veiled and reclining in the periphery of our national vision. For many citizens the dream is often of what once was as it fades before our eyes. In either case, at some point anyone who interacts with the city has to internalize the details of its sordid past whether consciously or unconsciously. Two plays at this year’s New Orleans Fringe Festival take periods from the city’s broad history of immoral dynasty and shape them into new forms of experimental theater. One of the most recognizable touchpoints is the era of legalized and regulated prostitution in the early 20th century, a social construct bound into geography in the Storyville district on the back side of the city. Blue Book: A Guide to Storyville, is this year’s entry from the Mudlark Puppeteers, a company that has had a string of successful and imaginative plays highlighting different eras and personalities from the city’s history. Last year was The Mysterious Axeman’s Jazz, a play about an ominous early serial killer who held the city hostage in 1918 after threatening to enter any house that did not play jazz. Pandora Gastelum, founder of the Mudlark Public Theatre and leader of its resident puppeteer group, told me that this year they’re taking a step back in time from that point to 1917, the year the Storyville district was finally shut down. Then, as now, the city depended on its reputation for exoticism to attract travelers, and guides known as Blue Books were offered to white men to assist their selection of a brothel. Like early marketing guides, they promoted the qualities of certain prostitutes--from girl-next-door types who could entertain with poetry or song to the exotic octoroons whose partial black ancestry offered an acceptable amount of exoticism for men who dared not fully cross the race barrier. Being a de facto authorized red light district, Storyville contributes to a collective memory of being proudly, wistfully wicked in a town where visitors coming in from the airport are still greeted with enormous billboards promising much the same bounties on Bourbon Street. The marketing arm of history sells the collection of bordellos on Basin as a failed social experiment vindicated for birthing popular jazz, ingredients that could easily be incorporated into some kitschy fare, but while Mudlark is famous for its expressive, beautiful puppets, Blue Book is no Disneyfied re-imagining of the place, its prostitutes or their patrons. All the characters presented were real people, and through the format of a Blue Book audiences will be introduced to their vignettes. Music from the time period will be played, and the show will investigate the problematic reality of having bevy of women with calibrated racial ratios being offered up for a whites-only clientele. The intersection of race and vice are at the heart of another play making its premiere at the Fringe, ...a member of the white race…. The play is a narrative drama based on a popular and successful boxer from the middle of the century, Ralph Dupas. Nicknamed variously the Native Dancer or the Cajun Ghost, Dupas was a short, mobile boxer who started fighting professionally at the age of fourteen and made it into the Louisiana Sports Hall of Fame. 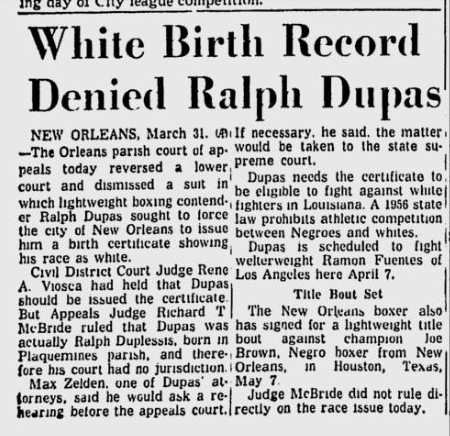 In 1957, Dupas was slated to fight Ramon Fuentes in New Orleans, but found himself fighting the courts instead when his status as a white man was challenged. That changed in 1956 when Louisiana passed a state law that strictly forbade interracial sports, codifying what was already being culturally enforced. As a result, Dupas found himself caught up in the ensuing witch hunt for athletes who had been passing as white. ...a member of the white race… plays out mostly as a courtroom drama based on the transcripts of Dupas’ original suit with the City of New Orleans in which he sought a birth certificate stating that he was white. While Burdine has made some dramatic and narrative blends of people and facts, the core of the case remains the same. Dupas’ family, who moved from rural Davant in nearby Plaquemines Parish, had “an elaborately planned, but still flimsy” plan when they moved into the Marigny neighborhood surrounded by people who did not know them. The case is an interesting highlight of how passant blanc became more of a challenge as the technology for confirming and presenting your identity moved out of the era of hearsay and baptismal records. Burdine told me that a central part of the play is the idea that “people believe what they want to believe.” Whether Dupas firmly believed that he was Caucasian or not, the fact that he fought so strongly to protect his reputation and lifestyle shows how desperately precious the social and class advantages even poor whites had over blacks. Your living could depend on it, even if you made that living with your fists. Blue Book: A Guide to Storyville has seven performances at the Mudlark Public Theatre. For showtimes & tickets, click here. ...a member of the white race...has five performances at the Ashe Cultrual Arts Center. For showtimes & tickets, click here. Go to our dedicated New Orleans Fringe Festival page for more feature previews and reviews.